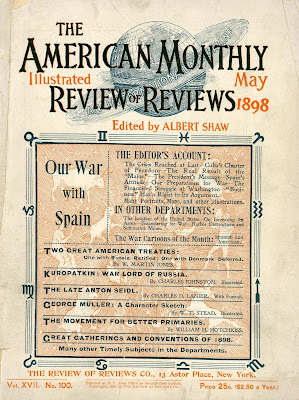 Graphics from Review of Reviews (American) 1898. “Vin Mariani” was a notorious cheap wine laced with cocaine, named for Cardinal Mariani. It gave such a “buzz” that users thought it was the universal panacea. 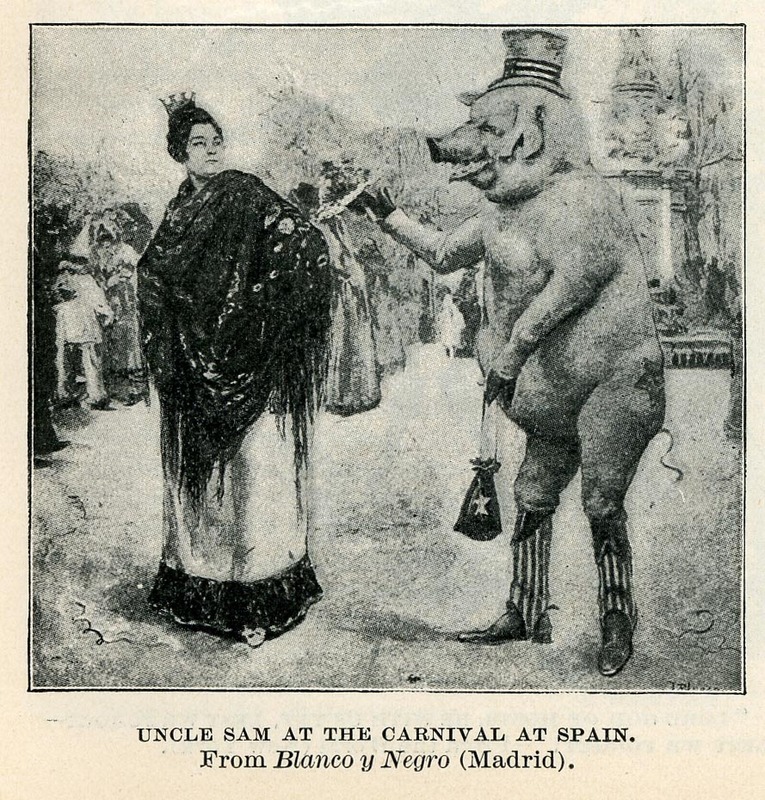 Images courtesy E. M. Sanchez-Saavedra. Charles Henry Bennett, cartoonist and children’s book illustrator, began his artistic career contributing to Diogenes, a comic journal started on Jan 1, 1853, edited by Watts Phillips, author of the celebrated serial ‘The Dead Heart,’ and George Cruikshank’s only pupil. Contributors of text were Robert Brough, William Brough, Angus Bethune Reach, Augustus Mayhew, and George Ausgustus Sala. The proprietor was Robert Kemp Philp. W. McConnell and C.H. Bennett contributed cartoons. Diogenes died on August 1, 1855. 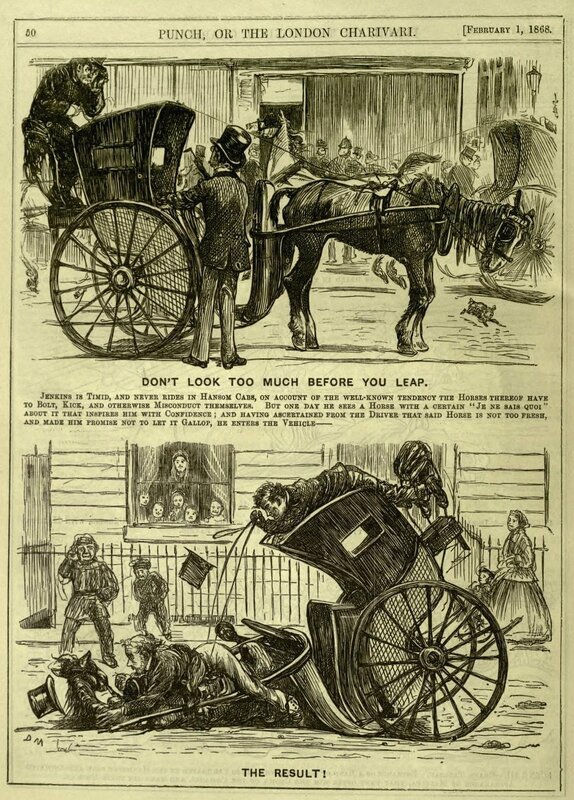 “This paper was started by Herbert Ingram, the proprietor of the Illustrated London News. There had been a quarrel between Bradbury & Evans and Ingram, which resulted in the latter determining to run a rival to Punch. 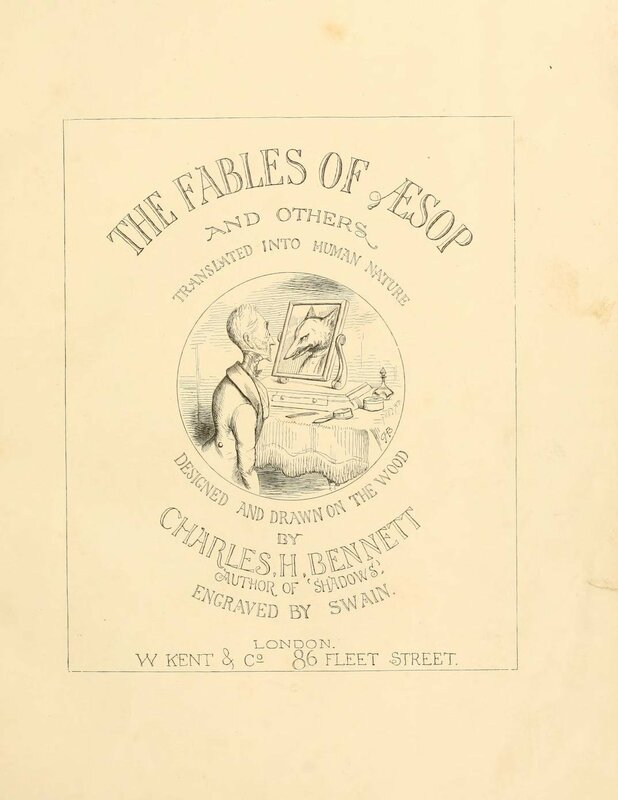 Edmund Yates was appointed editor, and he gathered around him a staff of contributors sufficiently strong to have ensured success had the business management been equal to the editorial arrangements. 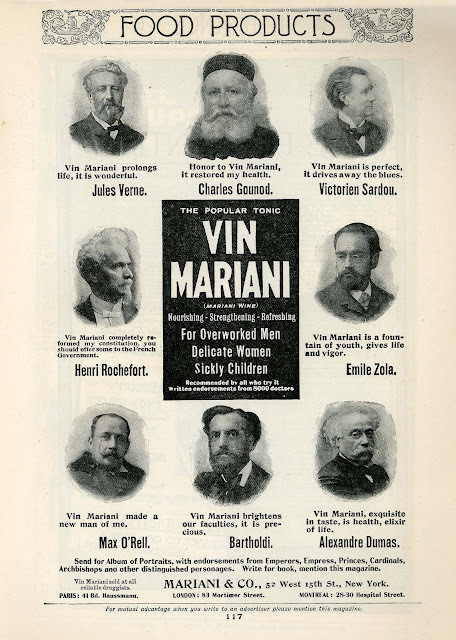 The contributors included William and Robert Brough, Sala, Albert Smith, Edward Draper, Godfred Turner, John Oxenford, and E.L. Blanchard: C.H. 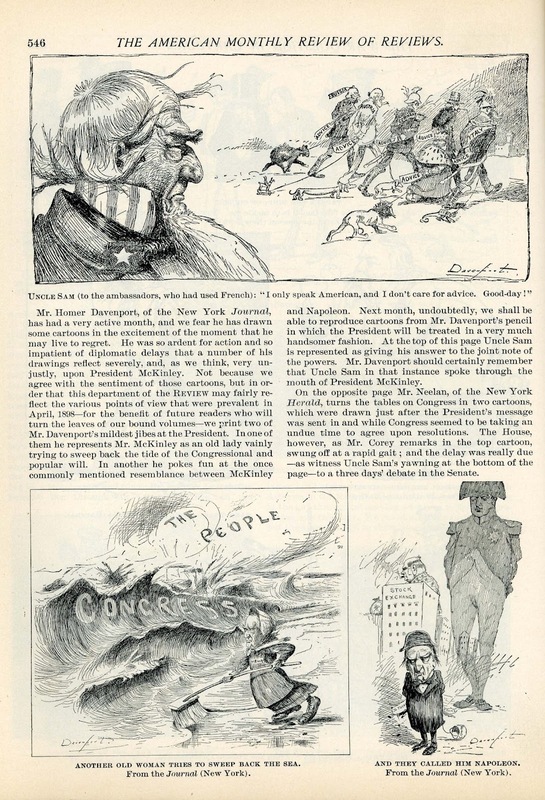 Bennett, W. McConnell, and Newman (of the defunct Diogenes), supplying most of the illustrations. 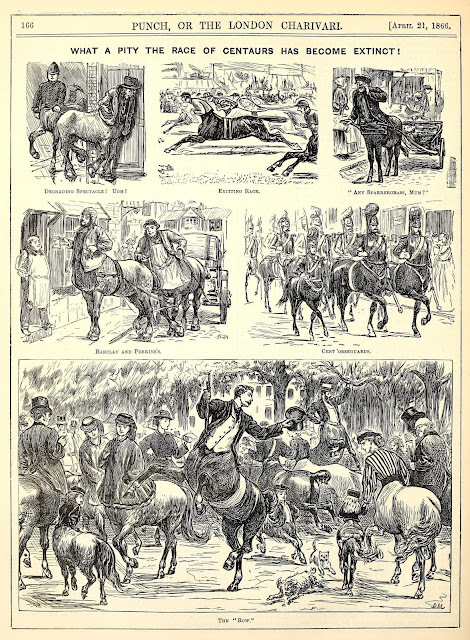 Robert Brough commenced in the second number a series of articles entitled ‘The Barlow Papers,’ which he illustrated himself. 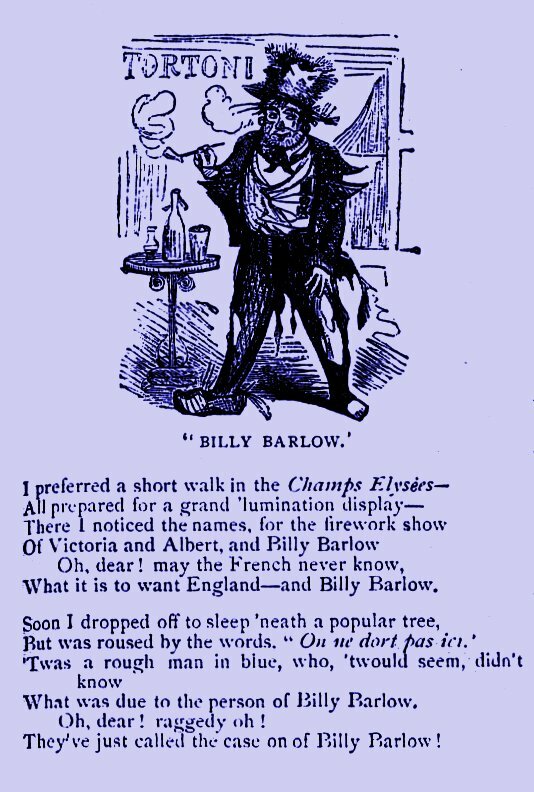 I have always thought that his Billy Barlow gave the idea upon which the modern Ally Sloper was founded. The paper had a brilliant but brief career. After the sixteenth number it was abandoned by its proprietor.” [The Printing World, Vol. I, No. 1, January 25, 1891]. 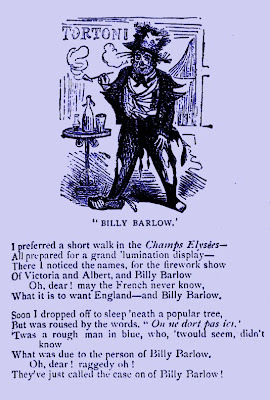 Illustrated Times, Dec 20, 1856. 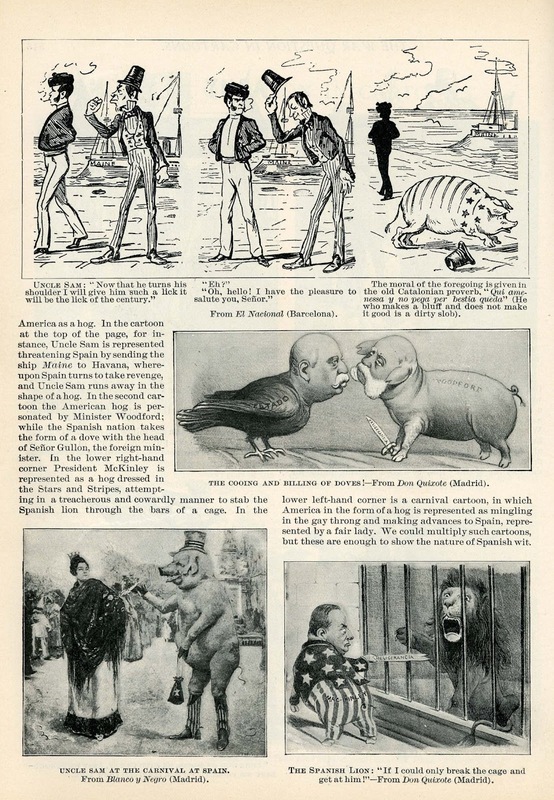 Bennett also drew a clever series on ‘The Origin of Species’ and various comic pages for Henry Vizitelly’s Illustrated Times in the fifties. 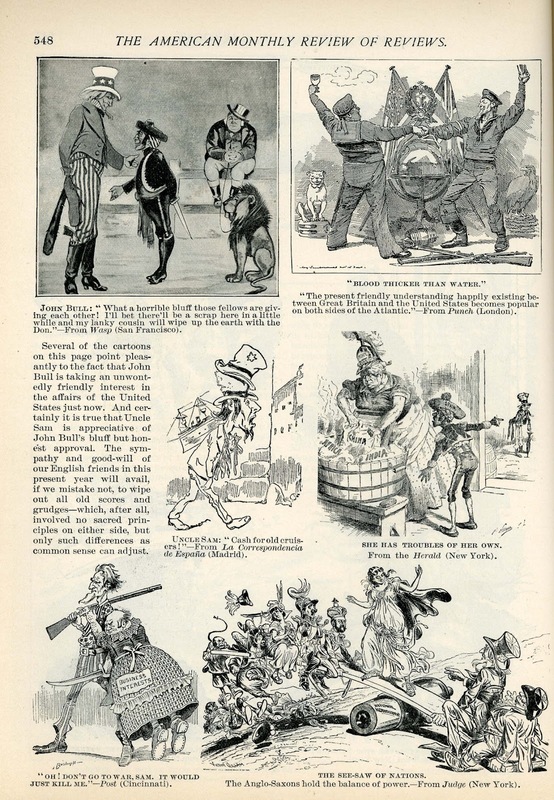 Other contributors were Phiz, Kenny Meadows, Charles Keene, Matt Morgan, George Cruikshank, T.H. Nicholson, Adelaide and Florence Claxton, and Gustave Doré. 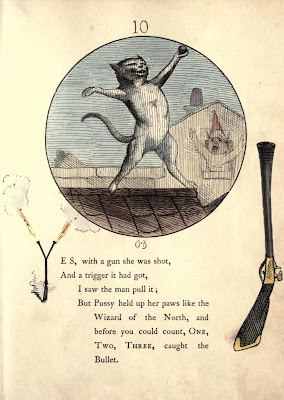 The Nine Lives of a Cat, c. 1866. C.H. 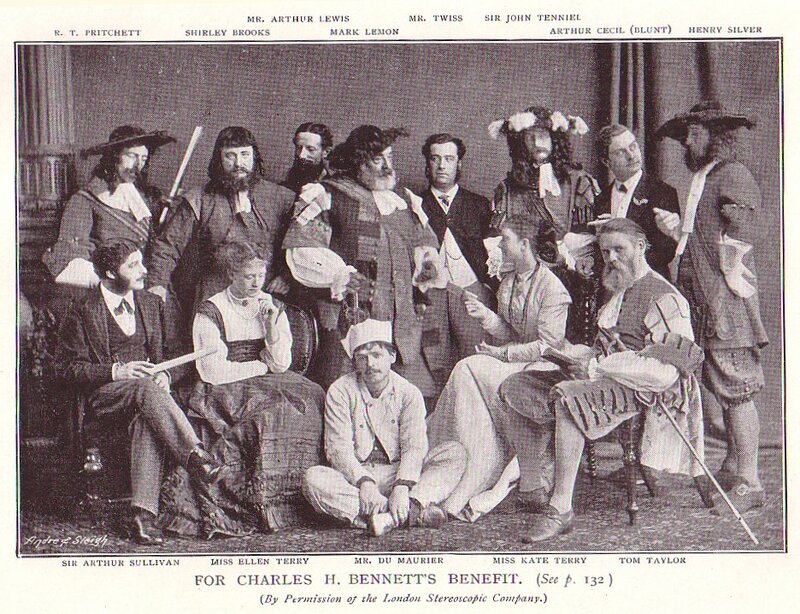 Bennett next contributed to Comic News (Jan 2, 1864, to Mar 14, 1865; 63 numbers) which was directed by H.J. Byron with the assistance of Tom Hood the younger. 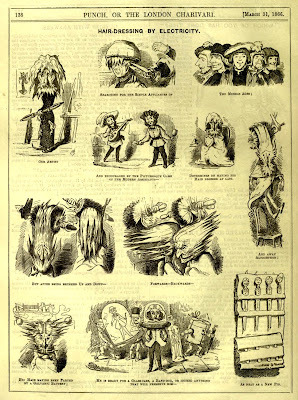 Bennett joined Punch in 1865 and his first work appeared on February 11, 1865, an initial for the ‘Essence of Parliament’ series. When he died in April of 1867 (replaced by Ernest Griset) he had contributed over 230 cartoons to the periodical. 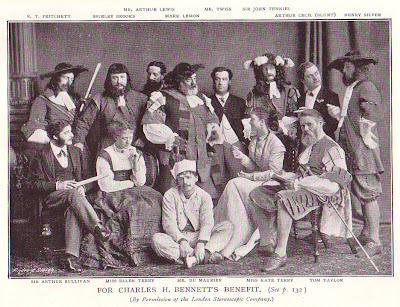 He started to carve his initials on the Punch Table but only got as far as the letter H.
Bennett was known as ‘Cheerful Charlie’ round the Punch Table. M.H. 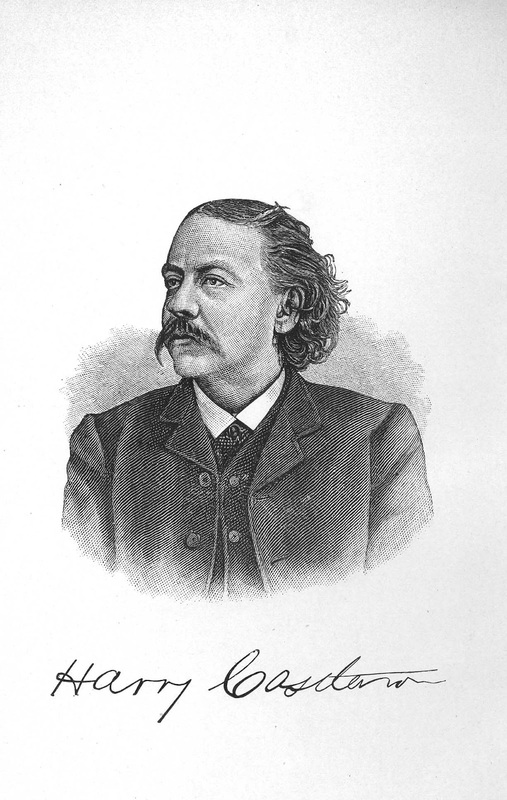 Spielmann described him as “in his way a man of genius not lacking academic training… He was originally a shoemaker; and though a little while before his early and untimely death he acquired some degree of celebrity and was enabled to live in material comfort, yet, for the most part, his life was passed in indigence and effort.” [Magazine of Art, Vol. 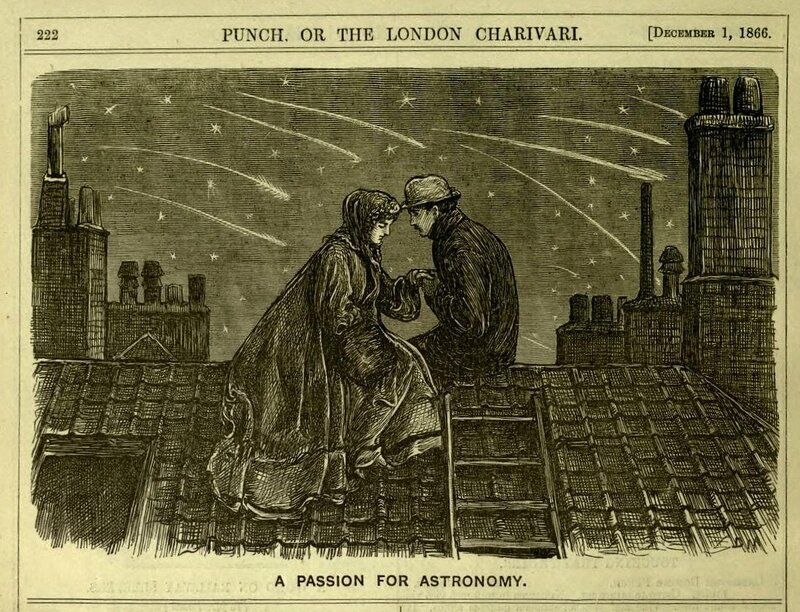 14, 1891]. 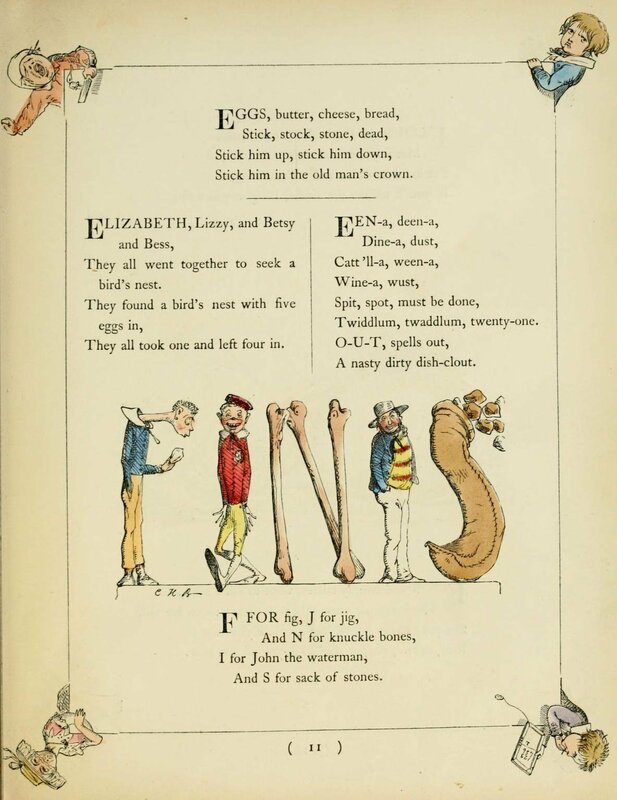 Old Nurse’s Book of Rhymes, 1865. 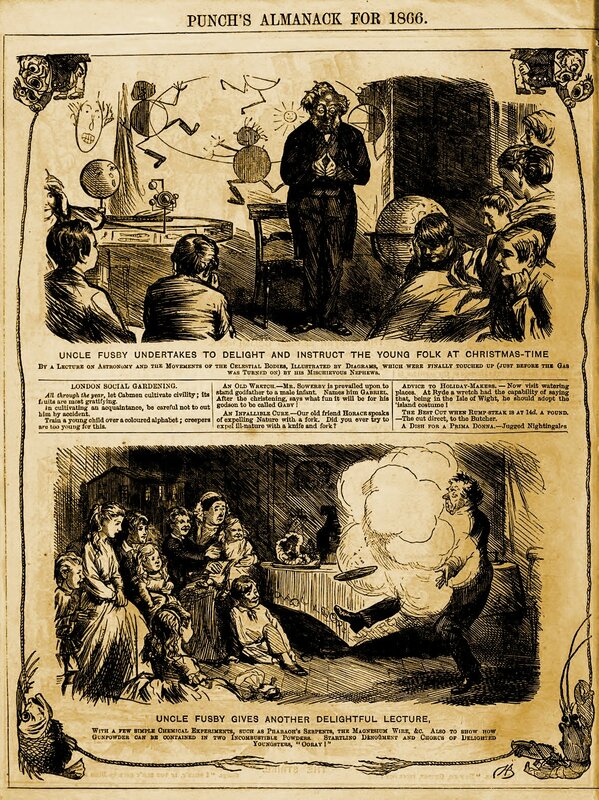 Speech Bubbles pop up occasionally in Victorian cartoons, but seldom do you find a whole comic page with balloons. Charles Samuel Keene drew this eye-popper “Our American Cousin in Europe” for Punch, Vol. 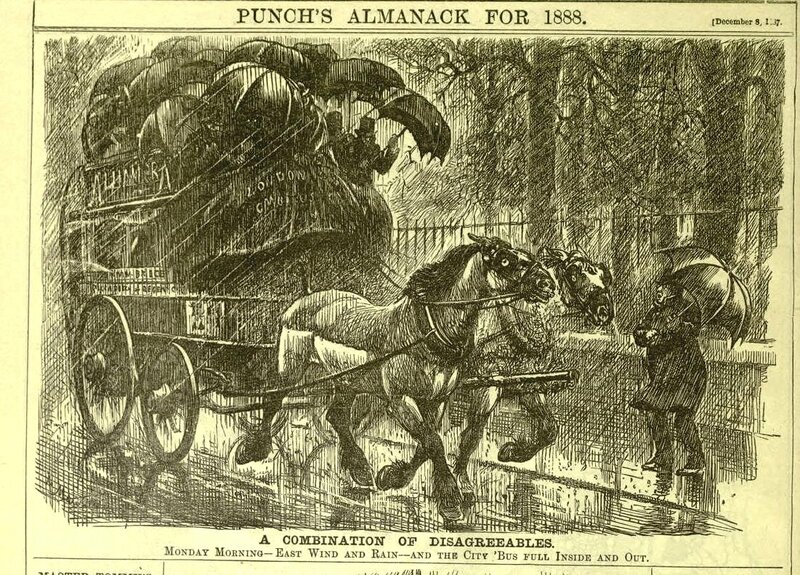 68, included in Punch’s Almanack for 1875. Keene is obviously trying to ape an American accent – badly. Below is a transcription of the text, as near as I can make it out. Makes you wonder if Victorians, who prided themselves on good handwriting, had much of a conception of printing by hand. 1 Some of our Gals’ Luggages! 2 Drop me for the Alps and back! 3 Your tailors are pretty good Britisher, but we beat all creation in Shirts! & our Bosoms are Soo-perb! 4 Guess you must v’ ped a powerful heap for that Soo-perior Back Switch Nip! 5 There’s a general look o’ disrepair about these olde countries Stranger, that we ain’t used to in New York! 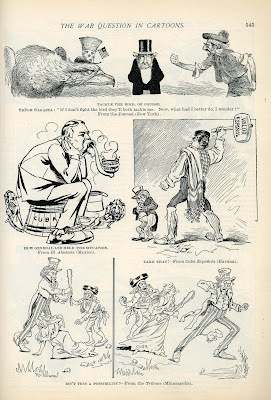 6 Knew where you came from directly Britisher! You speak ‘American’ with such a strong English twang! 7 Garçon! Comment pensey vous q’un gentilhomme peut manger da petits pois avec tel couteau comme ça?! 8a My dear Cassandra hadn’t you better go to bed? 8b What, atop o’ that tea Ma?! Wouldn’t sleep a wink! 9 Saw the Father o’ my Country in Wax at Mad. Tussaud’s! 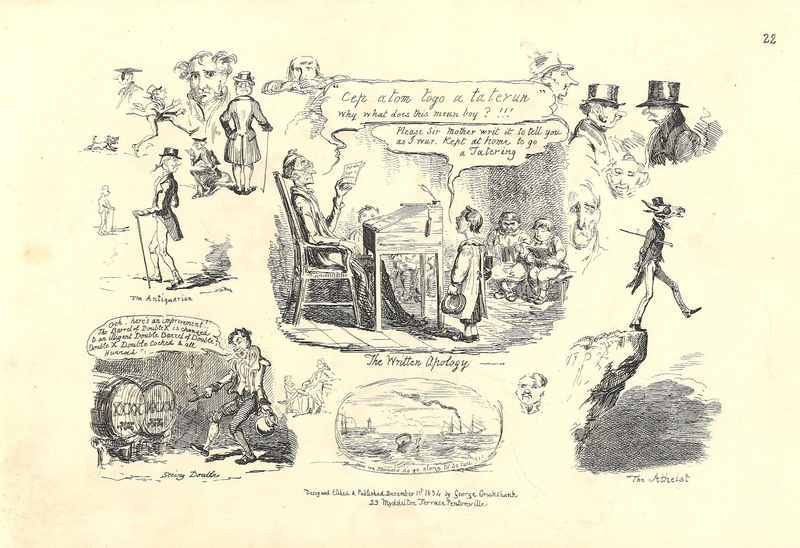 George Cruikshank strip above, from The Comic Almanack For 1849, Second Series, 1844-1853. Folding plate from a reprint by Chatto & Windus, 1912. 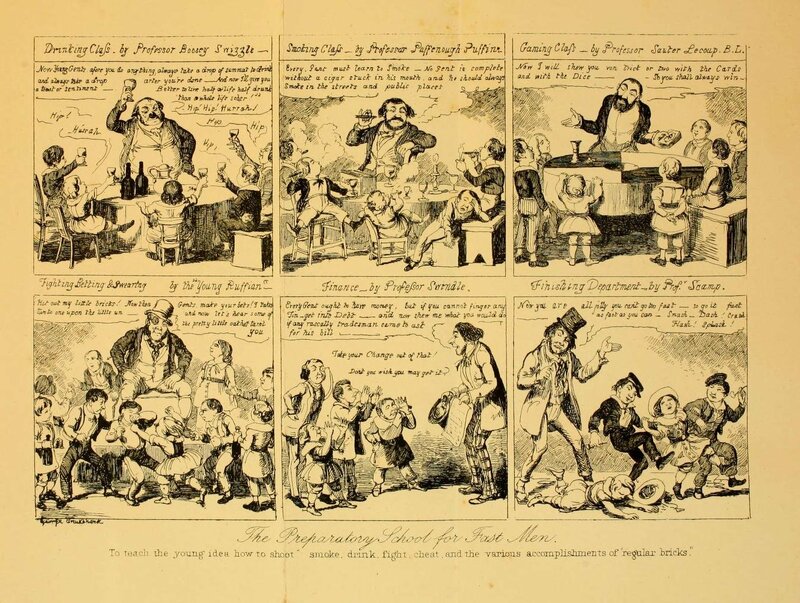 Whereas the Keene bubble comic was a wood-engraving, Cruikshank’s The Preparatory School was steel engraved. 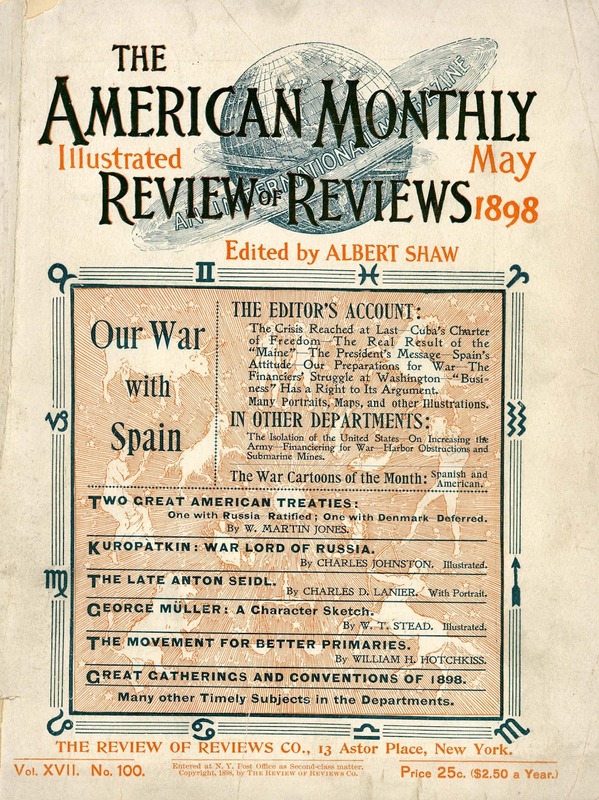 The American edition of the Review of Reviews began in January 1890 in New York and was, in the beginning, nearly identical to William Stead’s London-based Review of Reviews (1890). Beginning with vol. 3, no. 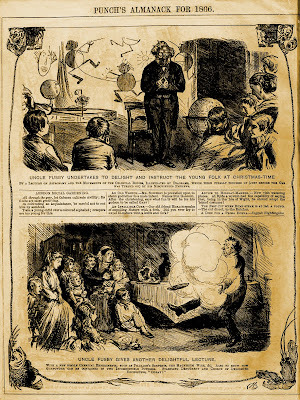 15, April 1891, the American edition was no longer identical with the English edition (which continued publication until 1936). 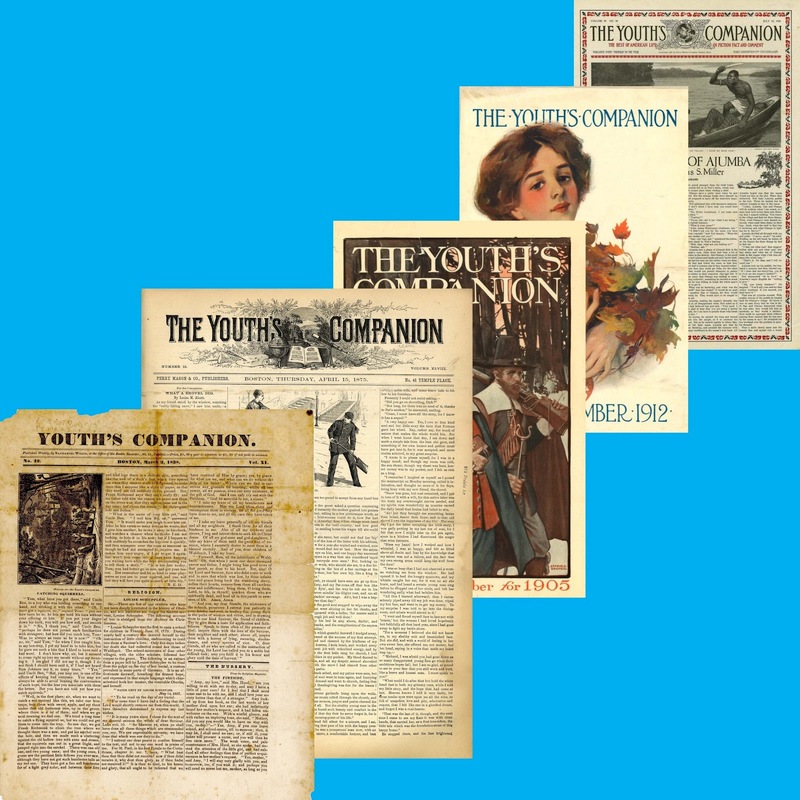 A similar – and possibly related – publication was The World's Work A History Of Our Time (1900-1932), which began publishing under the title Review of Reviews and World's Work in 1929. A: If you answered Sir Laurence Olivier, playing Dr. Josef Mengele, and several Adolf Hitler clones, score yourself zero. If, however, you correctly stated that they were Col. William Norris of Alabama and a large group of southern expatriates determined to keep a remnant of the Confederate States of America alive, give yourself ten points. 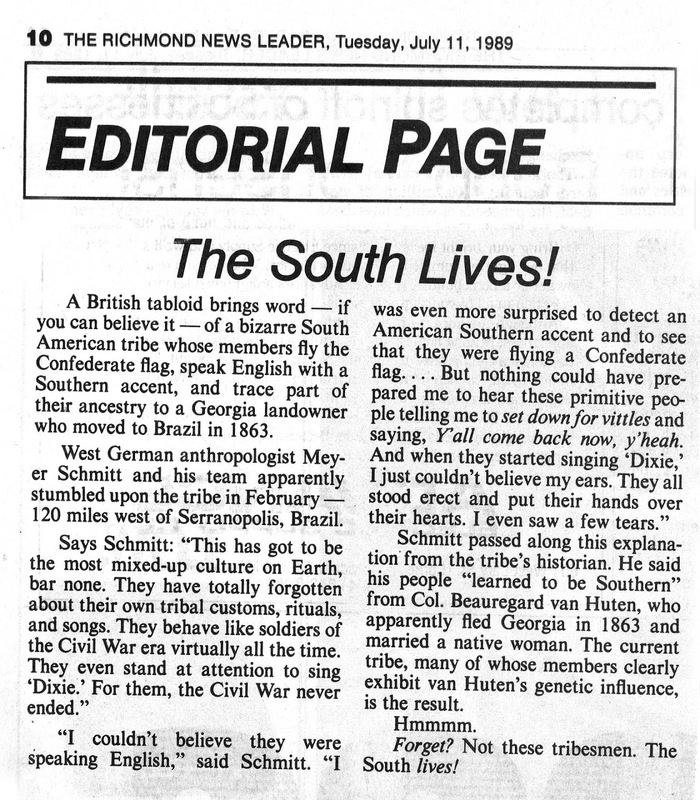 Another trick question: Was Mississippi a Union or Confederate state? A: Thanks to a stubborn Unionist majority in Jones County, MS, the answer is both! 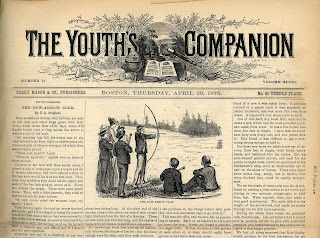 Most mainstream studies of the American Civil War fail to address or even mention these historical oddities, yet a couple of forgotten nineteenth century juvenile series books used these situations as major plot elements. 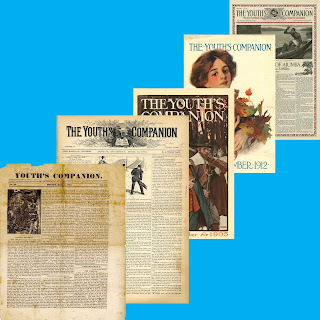 Two popular and prolific writers for nineteenth-century teenagers were “Harry Castlemon” (Charles Austin Fosdick, 1842 or 1844?-1915) and Charles Asbury Stephens (1844 or 1847?-1931). 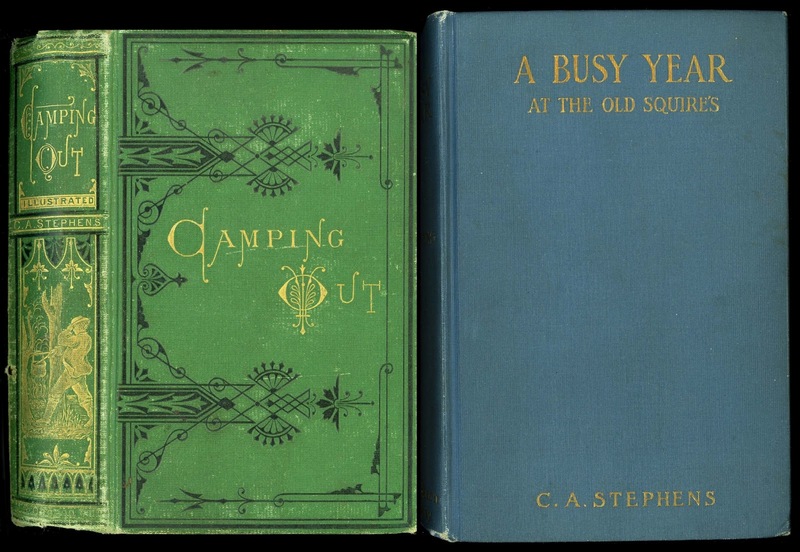 Both men were outdoors enthusiasts, and filled their novels and short stories with tales of wilderness camping, fishing, hunting and trapping. 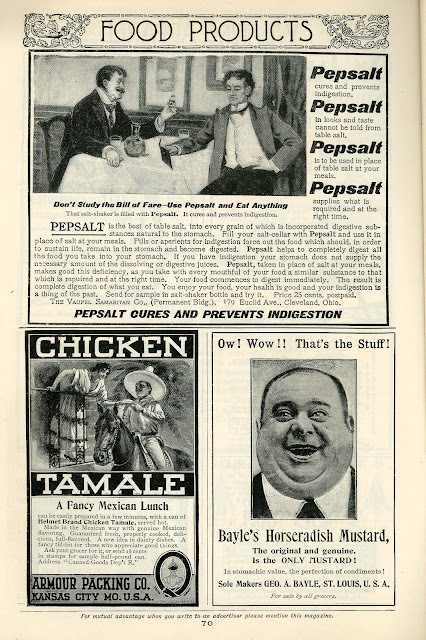 Fosdick hailed from upstate New York, while Stephens was a real “daoun Easter” born in Norway, Maine. 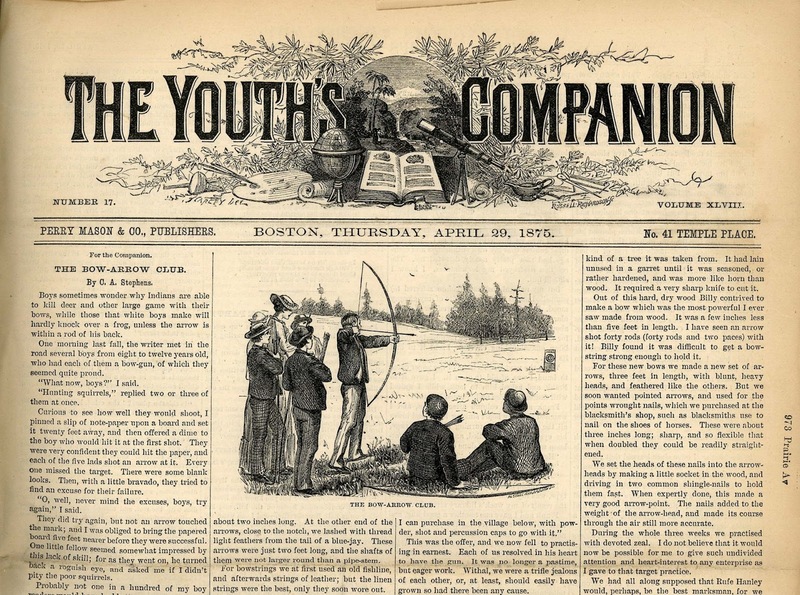 Although their interests were nearly identical, Fosdick only completed part of a high school education before he enlisted in the U.S. Navy in 1862. Most of his military service with the Mississippi River Squadron under Admiral David Dixon Porter was as a receiver and superintendent of coal supplies, although he did spend some time aboard a “brown water” gunboat. He was mustered out in 1865 and went into clerical work near Cairo, Illinois. Inspired by the adventure/natural history books of Capt. Mayne Reid while a schoolboy, Fosdick wrote three volumes about the fictional “Frank Nelson”, the boy hunter and naturalist, before joining the navy and three subsequent volumes about Frank’s experiences in the Mississippi Squadron. With the encouragement of Admiral Porter he submitted the manuscripts to Cincinnati publisher R.W. 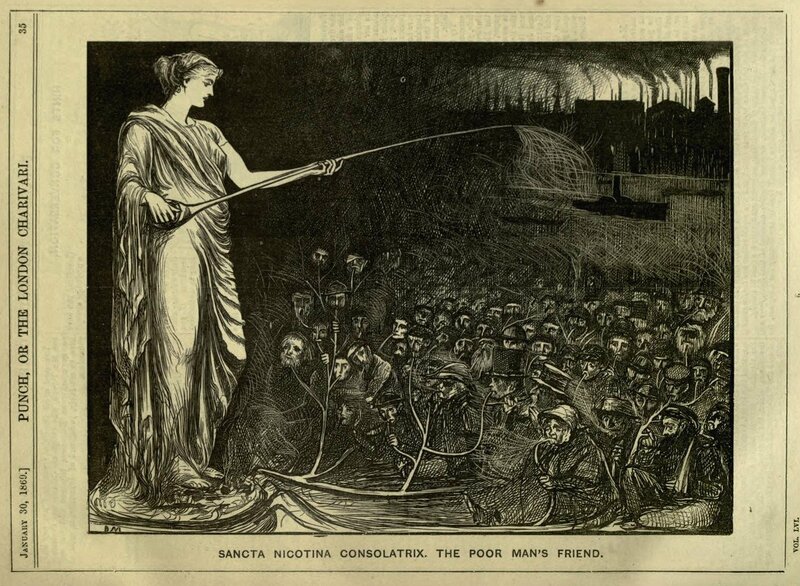 Carroll and they appeared as the Gun-Boat Series. 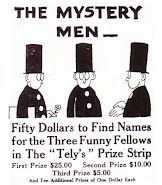 Under the pen names “Harry Castlemon” and “C.B. Ashley” he eventually produced 58 juvenile series books. Two further series followed Frank Nelson and his cousin Archie through various adventures out west, following their wartime naval service. C.A. Stephens was too young to serve in the war, and spent those years working hard on his grandfather’s farm to earn tuition money. After attending the Norway Liberal Institute, he put himself through Bowdoin College in two years, graduating in 1869 at the head of his class. One of his instructors, the Rev. Elijah Kellogg, also a novelist, urged young Stephens to write for Ballou’s Monthly and the Youth’s Companion. The publisher of this venerable paper, Daniel Ford (a.k.a. “Perry Mason,” a name which later inspired Earle Stanley Gardiner’s paperback lawyer,) recognized Stephens as a wonderful asset and sent him off to travel and write up descriptive articles. 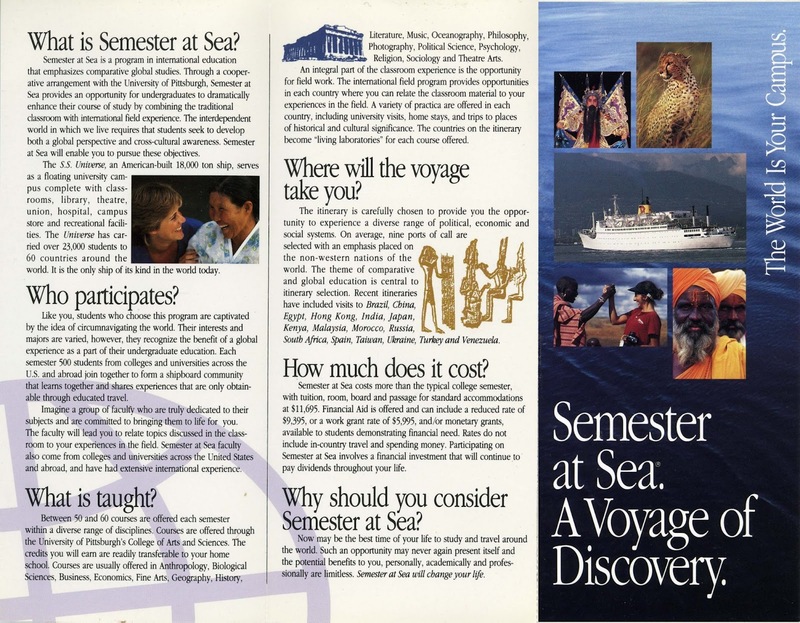 Two decades of rambles through North and Central America, the West Indies and Europe resulted in dozens of factual articles and fictional pieces. 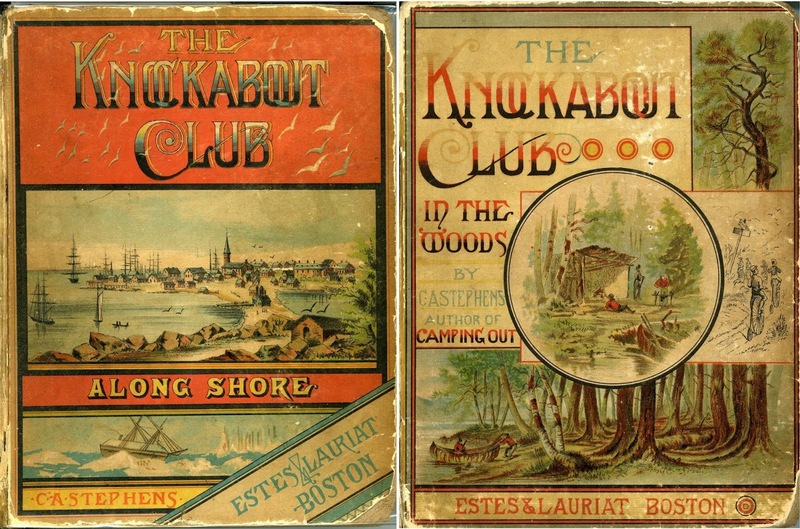 These were recast as volumes in his popular Camping Out series of 1872-1874 and Knockabout Club series of 1882-1883. 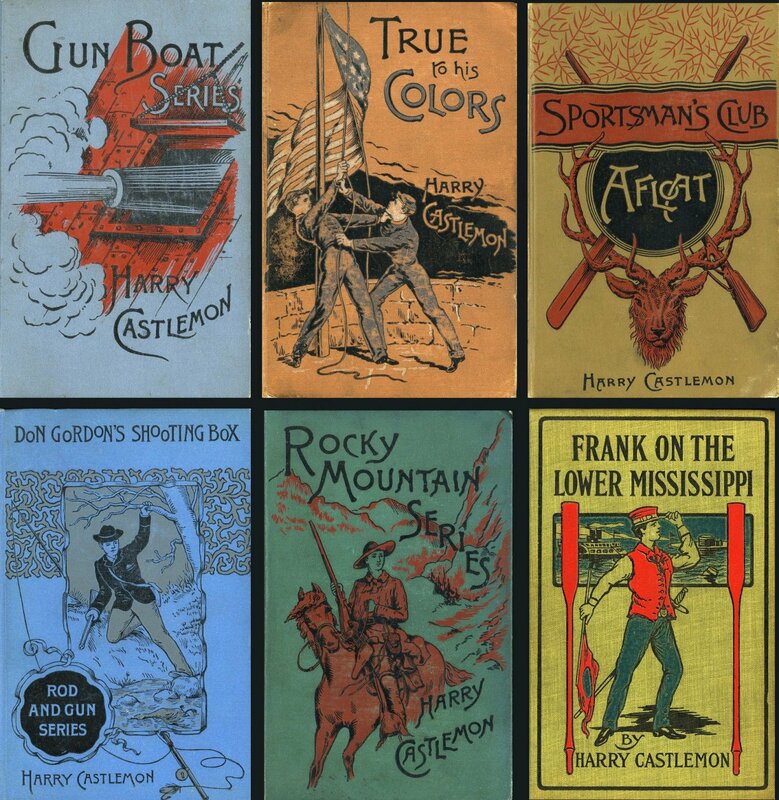 Like the novels of Mayne Reid and Harry Castlemon, they alternated adventures and natural history lessons in geography, geology, zoology, botany and ethnology. 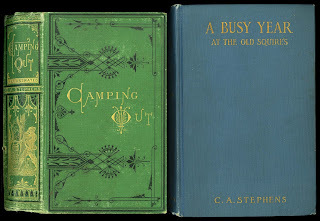 In addition to these loosely plotted travel adventures, Stephens wrote many sketches of life at “the Old Squire’s” based on his childhood at his grandfather’s farm. 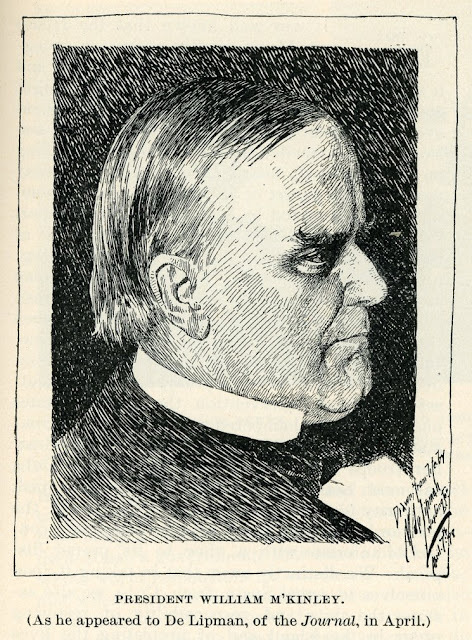 In 1884, publisher Daniel Ford made Stephens a unique offer: the magazine would subsidize him to enroll in Boston College’s medical school. Stephens received his M.D. degree in 1887 and supplied many scientific and medical articles. Always a visionary, he had two pet projects: a “floating university” as described in his series books, and research into prolonging human life. 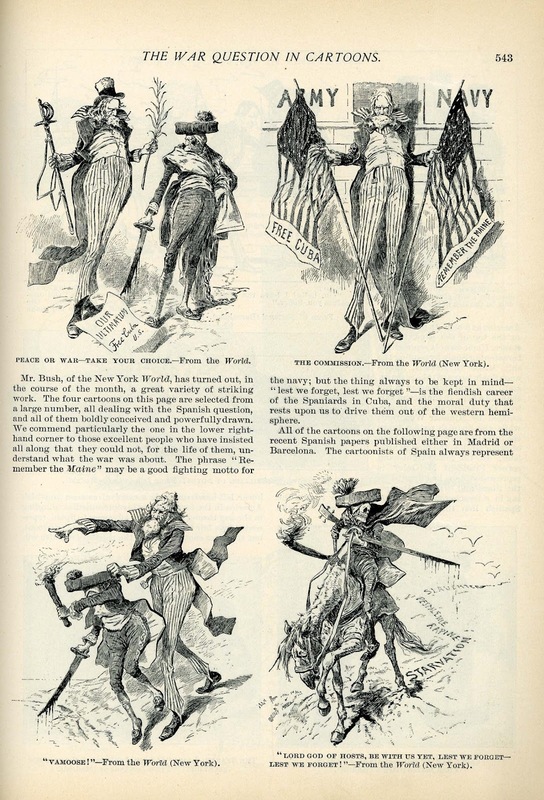 Since the Civil War was the defining epoch in their lives, it figured largely in their fiction, including works that were studiously “not about” the war. Both men were original thinkers and dealt with issues not covered by most popular novels of the time. 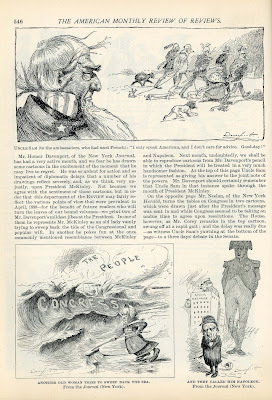 While Republican politicians in the north were dramatically “waving the bloody shirt” at defeated southerners and Democratic opponents, Castlemon set a number of his stories in the former Confederate states, and presented his boy heroes sympathetically. As a veteran of four years service, including the siege of Vicksburg, no one could doubt his patriotism to the Union cause, and his books may have assisted reconciliation in a modest way. His War Series told the story of two boys at a southern military academy. One is a dedicated rebel and the other a strong unionist, who is forced unwillingly into privateering service. 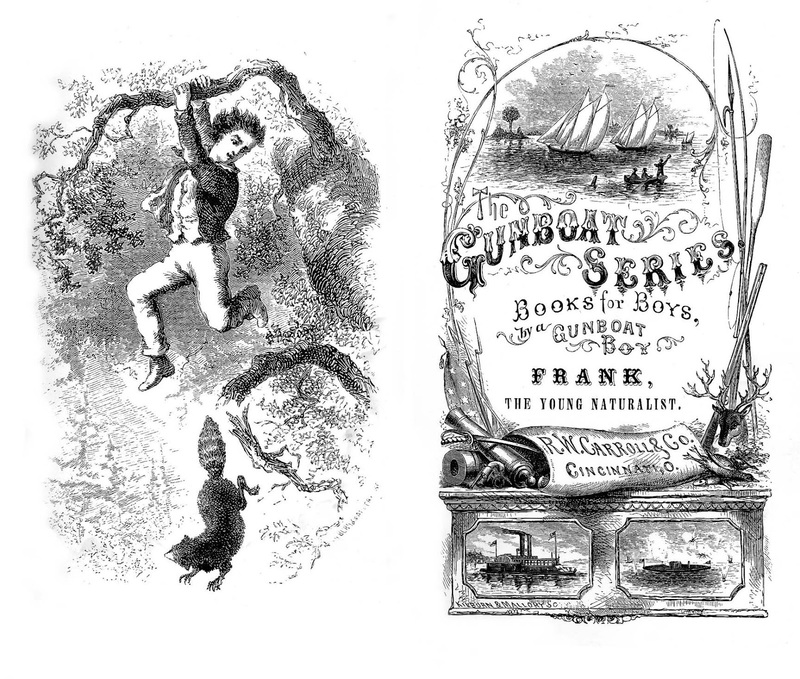 Ultimately, the Union lad escapes his oppressor and the Rebel boy becomes disillusioned with “the Cause.” The Boy Trapper and Rod and Gun series concern two sets of southern boys representing the planter aristocracy and the southern “crackers.” Several other Castlemon books were also set in the south. His most unusual novel appeared in 1897. 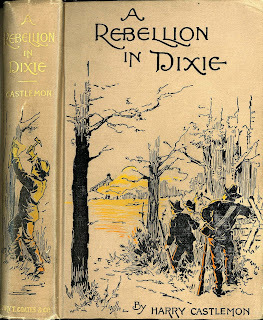 Entitled A Rebellion in Dixie, part of the Afloat and Ashore series, it told the story of a large number of Union sympathizers in Jones County, Mississippi, who seceded from the Southern Confederacy and held Confederate forces at bay throughout the war! For a detailed history of this episode, see Victoria E. Bynum, The Free State of Jones; Mississippi’s Longest Civil War (North Carolina, 2003). Most Americans learned of this “Kingdom of Jones” for the first time during Ken Burns’ epic 1990 PBS documentary on the Civil War. C.A. 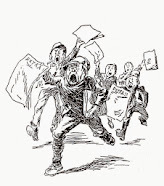 Stephens wrote no war stories as such, but the “late unpleasantness” is always lurking in the background of his books. 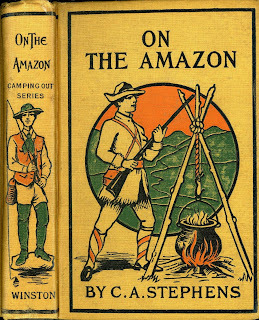 Camping Out, as Recorded by “Kit,” described the adventures of “Kit” (Stephens’ fictional alter-ego), G.W. Burleigh (“Wash”), J. Warren Raedway (“Raed”) and the son of a wealthy southern planter, Wade Hampton Additon (“Wade”). 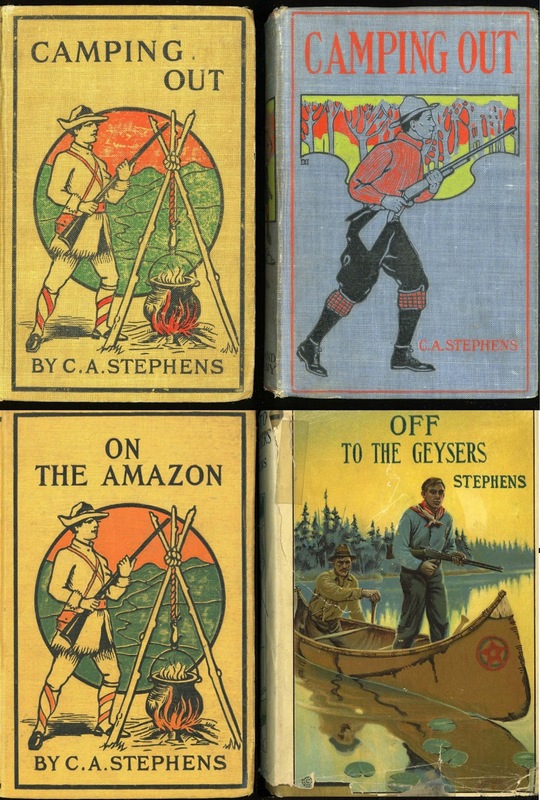 The six volumes of the series are “recorded” by one or the other of these characters, who were based on Stephens’ real-life friends and traveling companions. His father was a pretty big rebel in the war: so my father says. Was one of those that went down to South America, Brazil. You know a lot of those rebels did. Meant to found a slave empire in the Valley of the Amazon — some such nonsense. Guess they never made out much; though old man Additon (that’s the name) is down there yet… But the Emperor of Brazil has rather gone back on them; talks of freeing all the slaves. Rough on these Rebs who went down there to keep up slavery! Serves ’em right, though, I say. 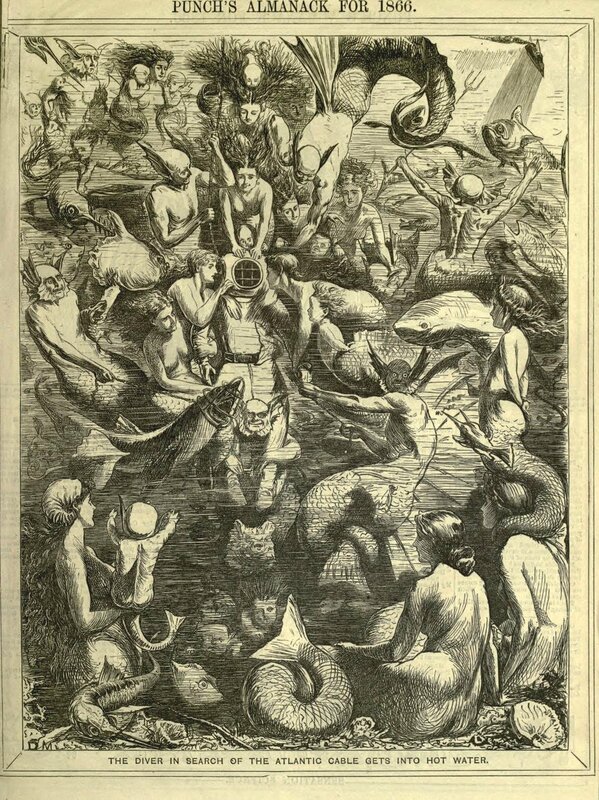 In the 1872 book, On the Amazons; or, The Cruise of “The Rambler” as Recorded by “Wash.” Stephens presented a fairly accurate picture of this expatriate settlement in the heart of the Amazon rainforest. At the time, the revelation was as unnerving as the rumors of a “Fourth Reich” re-forming in Paraguay, funded by the “Odessa” organization, would be during the 1950s. 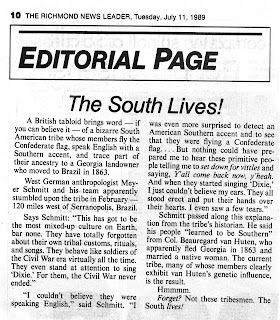 See Cyrus and James Dawsey, The Confederados; Old South Immigrants in Brazil (Tuscaloosa and London: The University of Alabama Press, 1995). After their yachting adventures around the world, the four boys sail to Brazil so “Wade” can be reunited with his family on their wilderness plantation. In addition to the story narrative, the book presents a wealth of lore about the cultivation of rubber, agricultural products, and wild animals of the Amazon basin. Like the Irish, who have served in almost every army but their own, many ex-Confederates became soldiers of fortune and staffed the military forces of warring European and South American nations. Most southerners who wished to make a fresh start were more peaceably inclined and sought only a friendly land. Perhaps 20,000 Americans immigrated to Brazil, welcomed by Emperor Dom Pedro II who was desperate for settlers. 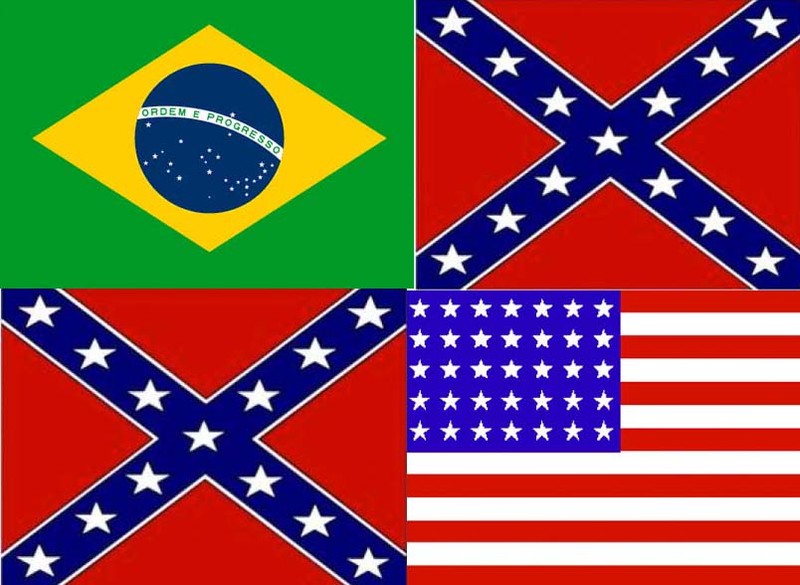 Nearly half of them were thwarted by the climate, tropical diseases and other hardships and returned to the U.S. A hardy core persisted and remained in the Santa Barbara D’Oeste and Americana regions of the State of Sao Paulo. Every now and again a journalist or filmmaker will stumble on an isolated enclave of native Brazilians who solemnly raise the stars and bars and sing “Dixie,” or a thriving rural community of “Os Confederados” who wear grey uniforms and crinolines to the April “Festa Confederada.” Despite these festive trappings, the community considers itself to be purely Brazilian, and has no intention of subverting the United States or recreating a slave society. 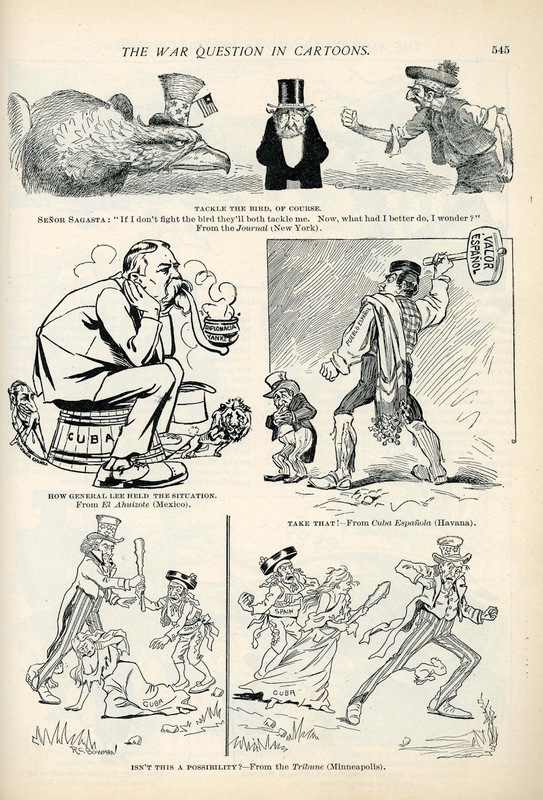 Although both Fosdick’s and Stephens’ books tend to ramble and wander off into digressions, their original viewpoints are worth a second look. Stephens’ crackpot medical theories about a miracle anti-aging protein called “biogen” proved worthless, but his “floating university” concept has been realized successfully as “Semester at Sea” and similar projects. His stories of Maine farming life in the 1850s, and yacht travel in the 1870s, are a fascinating window onto a long-vanished world. 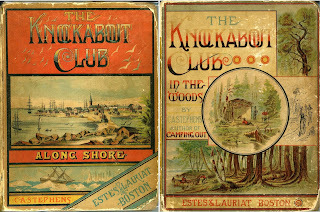 Volume II of the Camping Out series, Left on Labrador; or, The Cruise of the Schooner-Yacht “Curlew”, is partially based on true stories of marooned whalers who enslave their Eskimo rescuers. (The stark 1974 Canadian film “The White Dawn,” directed by Philip Kaufman and starring Warren Oates, Timothy Bottoms and Louis Gossett, Jr., based on James Archibald Houston’s novel of the same title, also deals with a similar incident.) 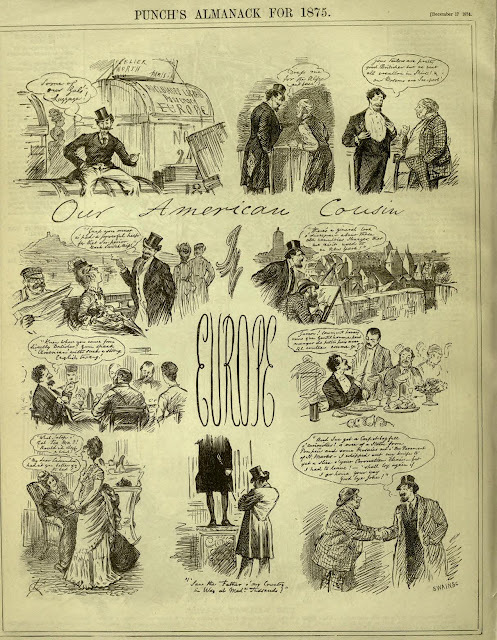 The most serious criticism that can be leveled at Stephens’ books by modern audiences is the depiction of the “Ugly American” abroad, treating “foreigners” with more or less contempt. 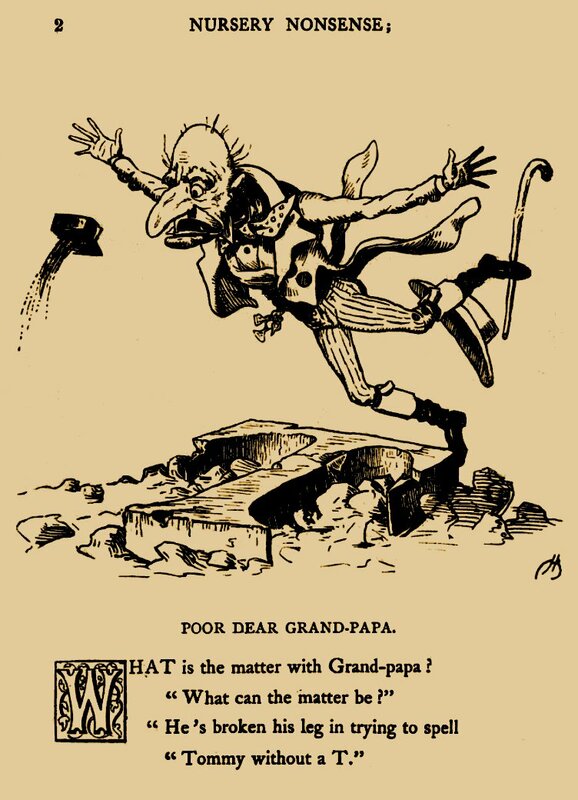 During his lifetime, Charles Fosdick was subjected to harsh criticism from librarians, who lumped his books, and those of Horatio Alger, Jr., in with dime novels and other subliterary rubbish. “Harry Castlemon” became the whipping boy of some moral uplift reformers who claimed that reading inoffensive series books could “blow out a boy’s brains” and warp his imagination. In fact, many of his books carry stern object lessons about foolish lads who ran away from home to emulate Texas Jack or Buffalo Bill and learned some very harsh realities about frontier life. 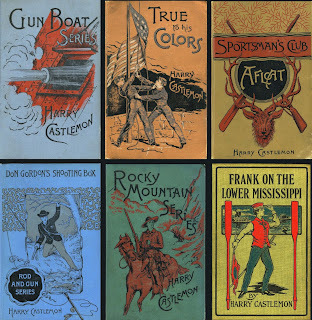 Books by Harry Castlemon HERE. 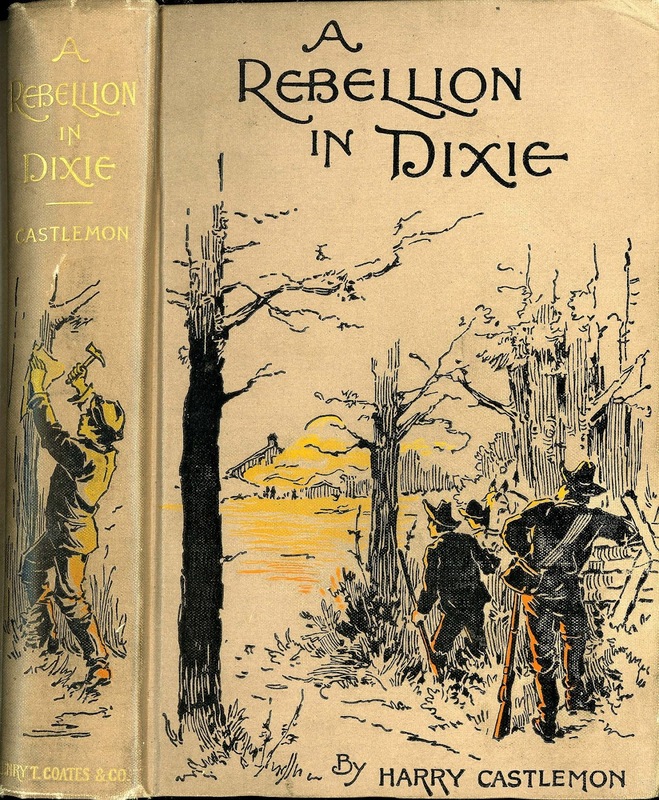 Castlemon’s A Rebellion in Dixie may be read HERE. 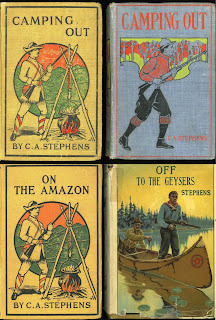 Other books by C.A. Stephens HERE. 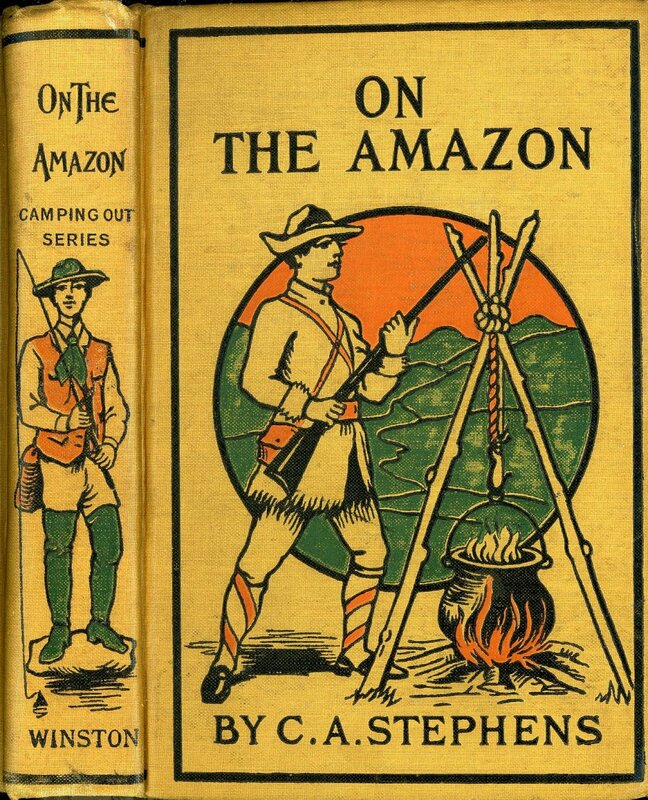 Stephens’ On the Amazons. HERE. Both Leech and du Maurier’s works were reproduced by wood engraving but the technology had changed by the nineties. 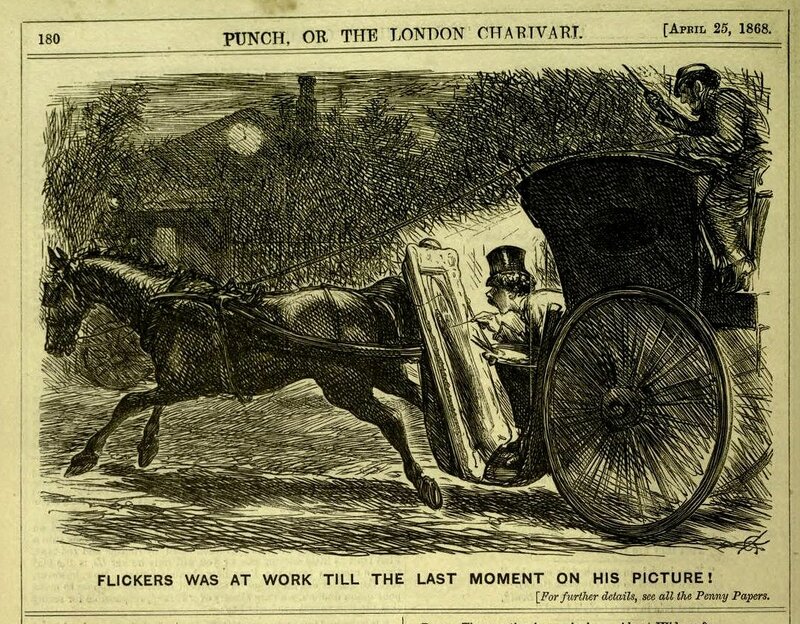 John Leech was of the old school, he had been drawing comicalities on the wood soon after C.J. 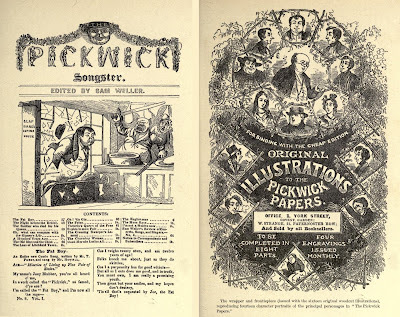 Grant illustrated the “Pickwick Songster.” John Leech (signing J.L. 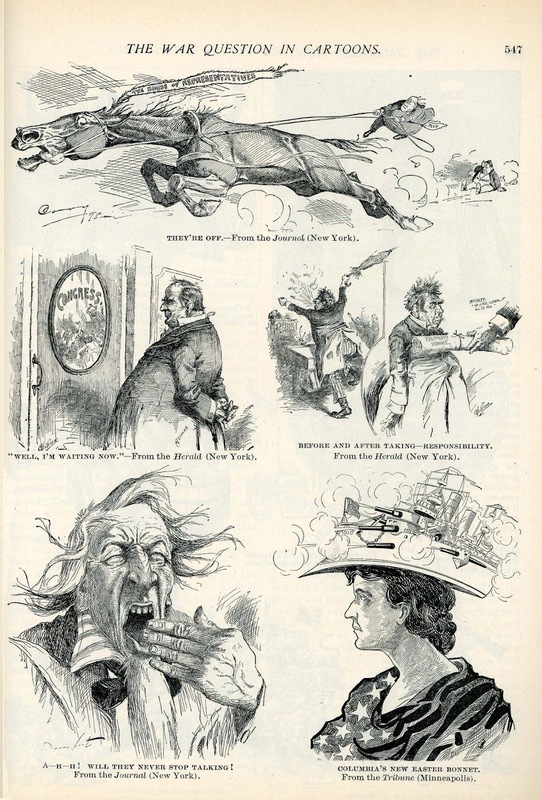 ), in company with the brothers Cruikshank, Robert Seymour, and Kenny Meadows, contributed comic cuts to Bell’s Life in London and Sporting Chronicle. 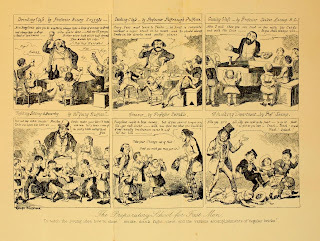 In February 1836, young Charles Dickens, a reporter on the Morning Chronicle, agreed to write a serial text to accompany comic prints by the caricaturist Robert Seymour. The first installment on March 31, 1836, was entitled “The Posthumous Papers of the Pickwick Club containing a faithful record of the Perambulations, Perils, Travels, Adventures and Sporting Transactions of the Corresponding members.” These numbers were edited by “Boz” (as Dickens signed) for Chapman & Hall, and contained four comic illustrations by Robert Seymour. 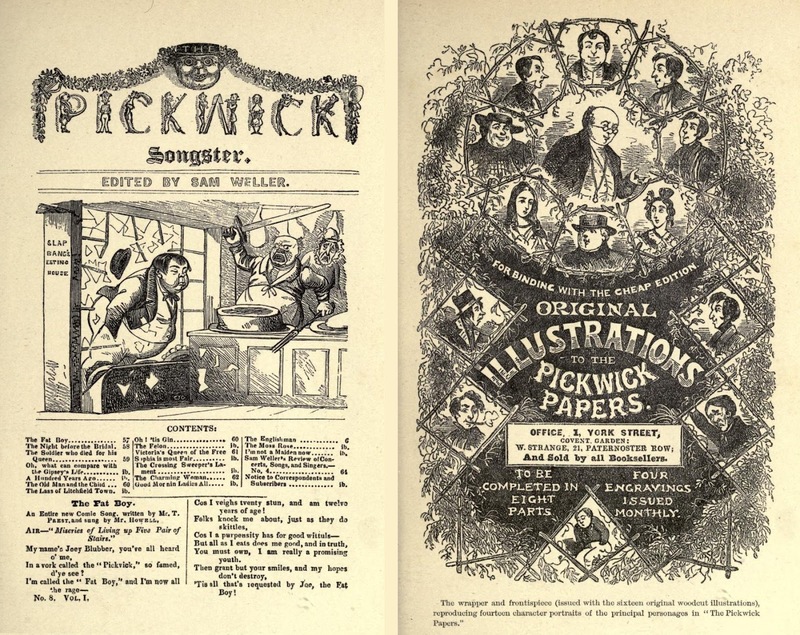 “Pickwick” was modeled on the illustrated penny part serials produced by the “unstamped” and was to prove an inestimable influence on the future of comic art and the rise of the illustrated book, newspaper, and magazine. G.W.M. 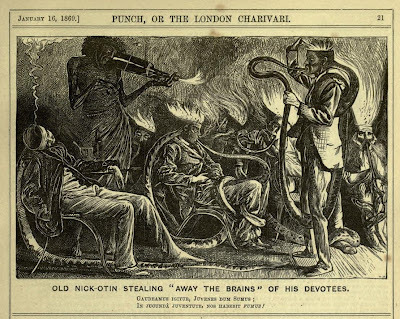 Reynolds’s shilling piracy “Pickwick Abroad; or, the Tour in France” was illustrated with steel engravings by caricaturist Alfred Crowquill. 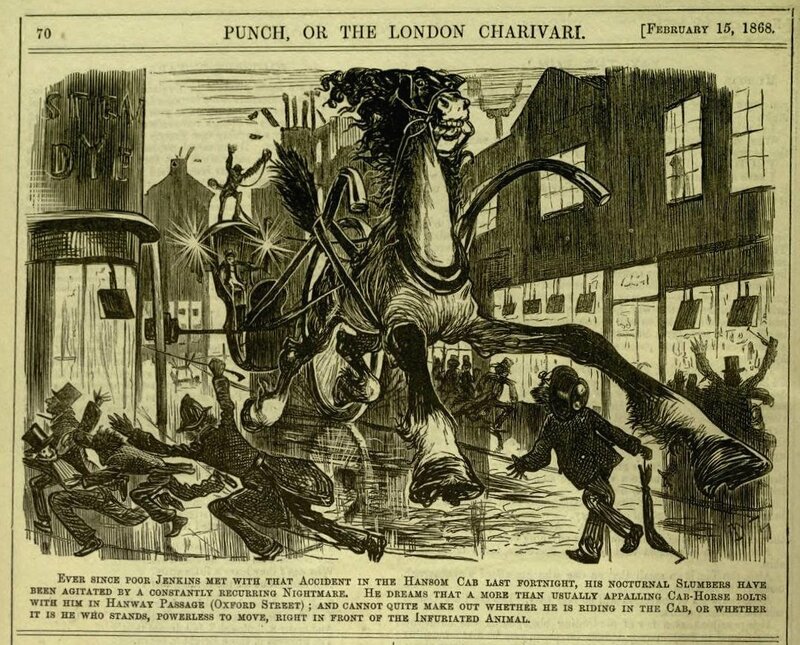 Punch; or; the London Charivari was modeled on the French comic periodical Charivari, and first published on July 17, 1841. 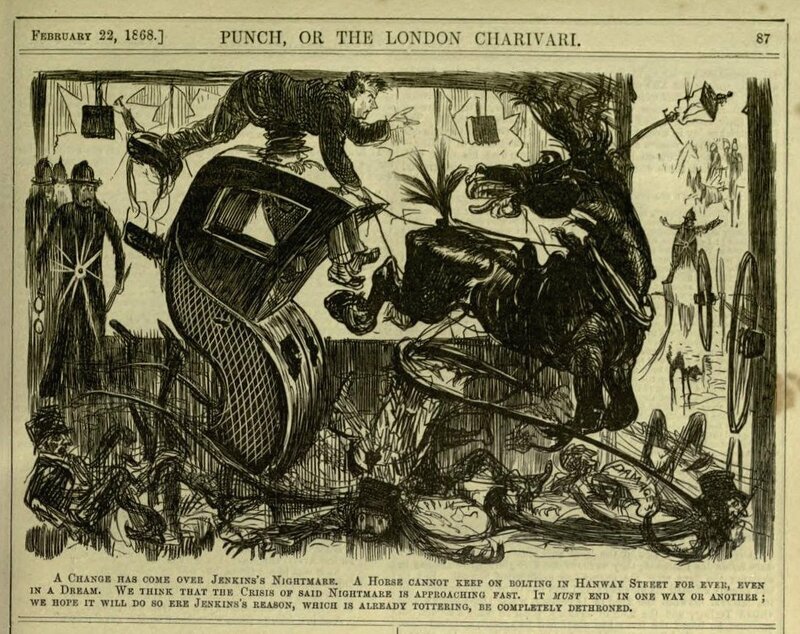 The originator of Punch was a wood-engraver named Ebenezer Landells, who passed his proprietorship on to Bradbury & Evans. The wood-engraving factory was taken over by Joseph Swain, Sr. 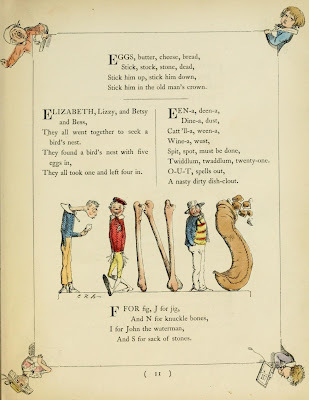 The editor from 1841 to 1870 was Mark Lemon [with Henry Mayhew]. 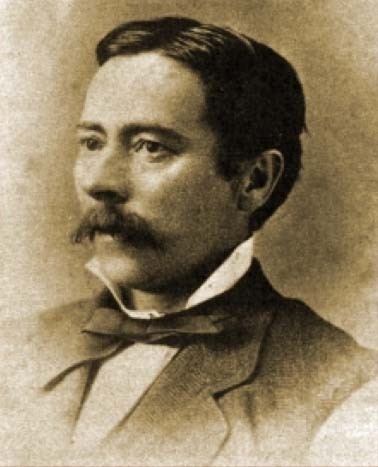 Shirley Brooks edited from 1870 to 1874, Tom Taylor from 1874 to 1880, and F.C. Burnand from 1880 to 1906. 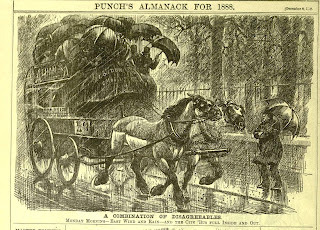 Each bound volume of Punch from 1842 to 1899 included a Punch’s Almanack. 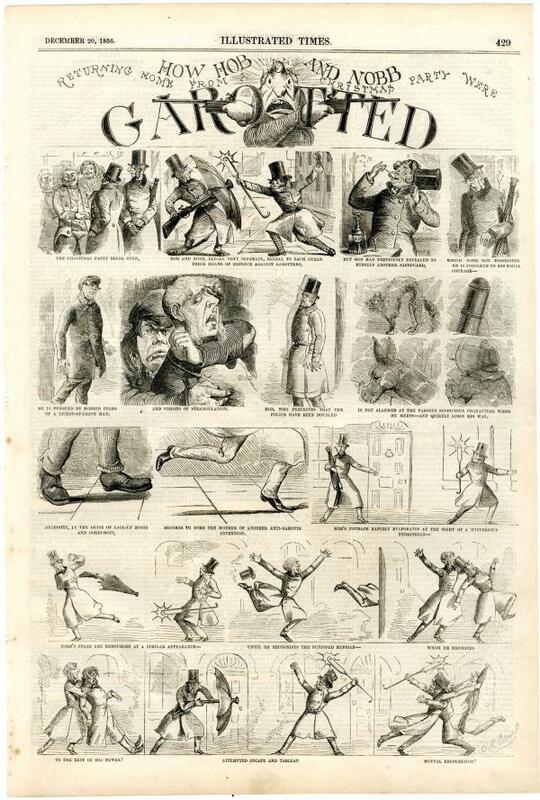 When John Leech produced “Tom Noddy” he would have drawn each panel separately, in ink, onto a single block of wood. For the final printing the boxwood images would be fitted together with brass bolts to make one full page caption strip. 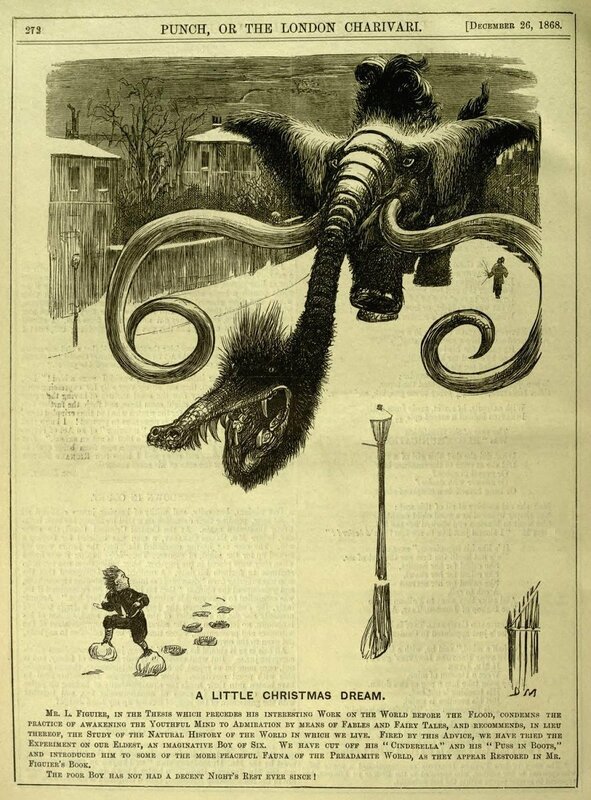 By the time du Maurier drew “Tom Noddy’s Christmas Nightmare” in 1891 the ink drawings were photographed directly onto the boxwood. 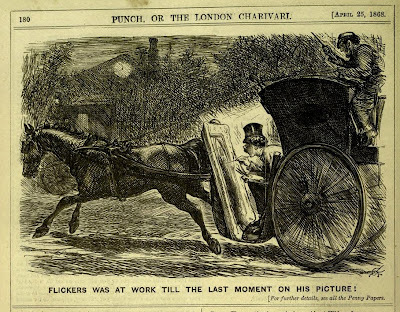 There was a good reason for the lack of speech “bubbles” in Victorian comics, and it had to do with the time-wasting cost of having woodpeckers chisel out every letter onto the wood block. Type-setting was cheaper and faster. 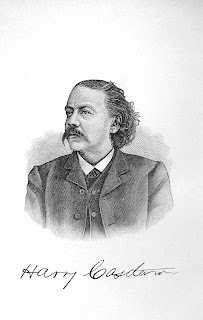 George Louis Palmella Busson du Maurier was born in Paris on March 6, 1834 to a French father and an English mother, and educated at London, Antwerp and Dusseldorf. He studied life-drawing at Gleyre’s atelier in Paris where he befriended the Impressionist painter Whistler. 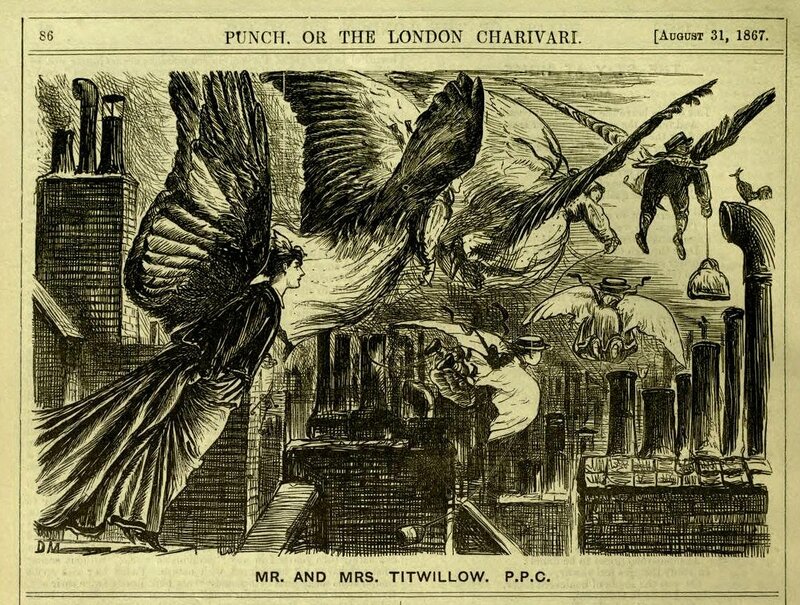 At Antwerp in 1857 du Maurier suddenly lost sight in one eye. For the rest of his life he lived in fear of total blindness. “It has poisoned all my existence,” he told an interviewer. 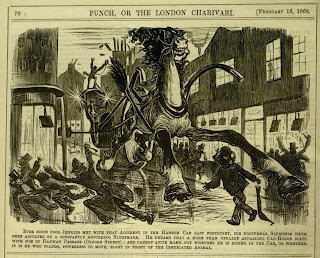 Inspired by Leech’s cartoons in the Punch’s Almanack he moved to London in hopes of gaining a berth on Punch. His friendship with Charles Keene [elected to the Punch staff in 1860], who drew full comic pages before du Maurier took his knife to the Punch Table, was probably a factor in his own adoption of the comic strip format. Du Maurier was referring to illustration, and it seems was unaware that in 1851 and 1852 two installments of “The Adventures of Mr. Verdant Green, an Oxford Freshman,” a strip by Cuthbert Bede, were published in The Illustrated London News. 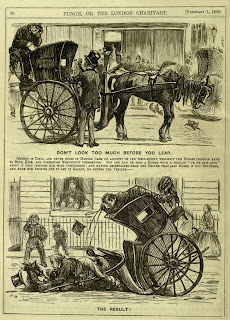 This high quality experiment led to full-page color and b&w comic strip pages in The Graphic, The Illustrated Times, and The Illustrated Sporting and Dramatic News. 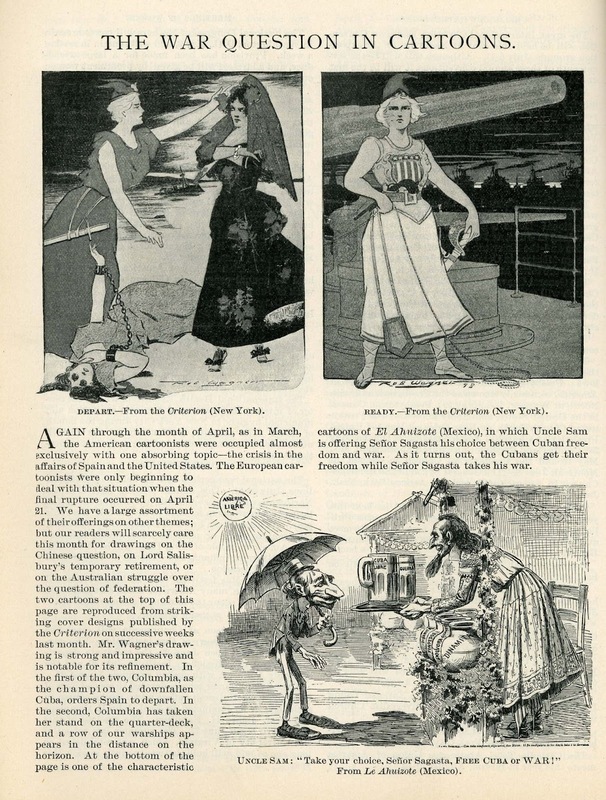 Most of the artistic contributors had trained in Fine Art and worked as illustrators on magazines, books, and illustrated comic papers. 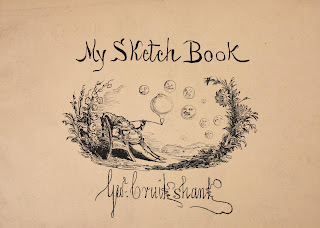 His background was in the Fine Arts and he was primarily an illustrator. 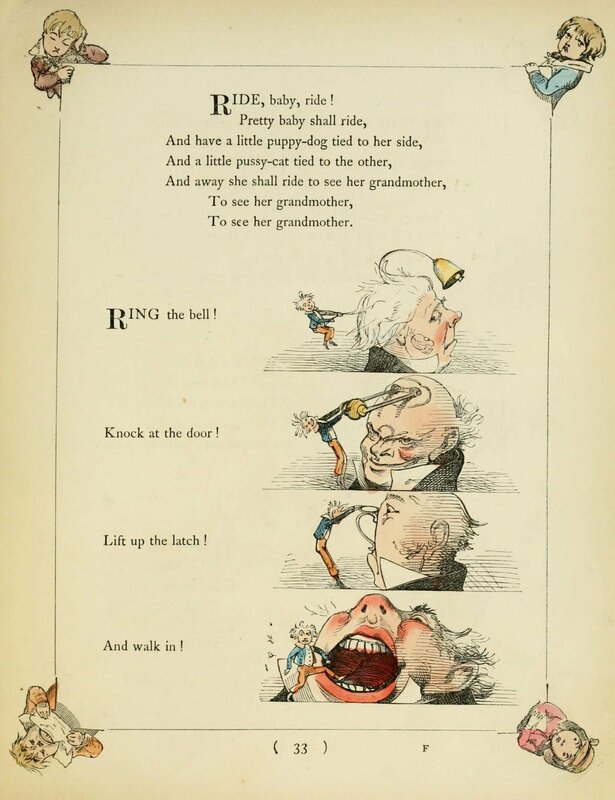 The older generation of book and magazine illustrators, Cruikshank, “Phiz,” and Leech, were caricaturists first and foremost. 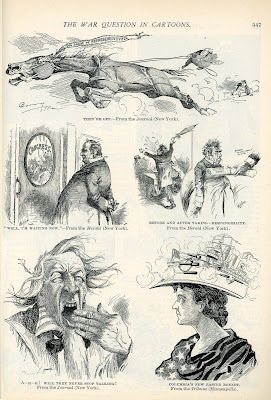 Du Maurier had a tough time getting started in illustration. In the beginning he was entirely dependent on sales to Once a Week, Good Words, the occasional Punch cartoon or initial letter. 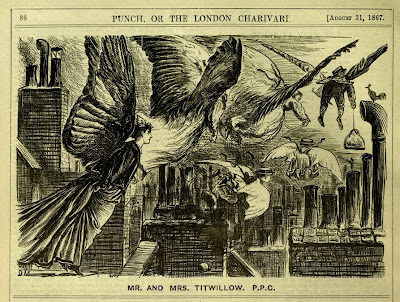 George du Maurier achieved fame as a writer with two novels that had dreamlike qualities; Peter Ibbetson (1891) and Trilby (1894). 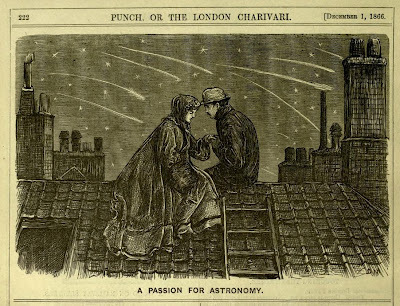 A third novel, The Martian, was being serialized in Harper’s when du Maurier died in London, on October 8, 1896, of heart and lung weaknesses, probably brought on by his excessive lifelong nicotine habit.